Mini Cockapoo - Is This Cute And Curly Dog A Good Pet? You are here: Home / Breeds / Mini Cockapoo – Is This Cute And Curly Dog A Good Pet? Mini Cockapoo – Is This Cute And Curly Dog A Good Pet? Welcome to our complete guide to the Mini Cockapoo. There is still plenty of desire for ‘thoroughbred’ pedigree dogs, and more than enough pet lovers that are happy to take in a scruffy-looking mongrel. But somewhere in between, mixed breeds are also increasing in popularity. Mini Cockapoos are one such irresistible example. 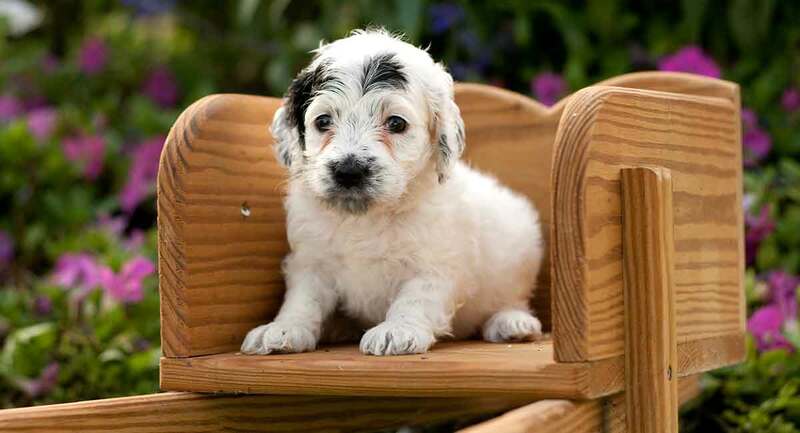 This pint-sized pup is a cross breed between a Cocker Spaniel and a Miniature Poodle. Let’s look at why people are so keen to embrace the Cockapoo in a smaller package. Miniature Dogs: How and Why? Let’s start with the easier of those two questions… ‘Why’? They might not be to everyone’s tastes, but huge swathes of canine fans just adore small dogs. It’s a case of the smaller the better to many folk. What’s the appeal, though? Well, the two most obvious answers are cuteness and practicality. You don’t need a large house to accommodate a very small dog. Nor do you need a big outside space. Small dogs are easy to lift out of danger, fit in the car, and carry into the vet’s clinic. and often require less exercise than their larger counterparts. While the miniaturisation of dogs is increasingly common, it’s a practice that often comes under fire from some quarters. It has its staunch advocates, but also equally as strong-willed and outspoken are its critics. Much of the debate centers around how to safely make a dog smaller. This is the healthiest way to breed a Mini Cockapoo, and luckily the most common. Standard Cockapoos are the love pups of a Cocker Spaniel and a Standard Poodle. Miniature Cockapoos are smaller because one of their parents – the Miniature Poodle – is smaller. Crossbreeding attracts it’s own share of debate however. It’s impossible to predict exactly which qualities of each parent puppies will inherit. And detractors believe that this unpredictability means that more owners abandon their dogs or fails to raise them properly, when they don’t get what they were expecting. On the other hand, crossbreeding can improve a dog’s overall health through the phenomenon of hybrid vigor. Also known as achondroplasia, dogs with dwarfism have disproportionately small limbs. Dwarfism sometimes occurs spontaneously in almost all dogs, but some breeds (such as the Dachshund) are defined by it. Creating Mini Cockapoos by selecting for dogs with dwarfism also introduces other health problems – especially bone and joint disorders. Responsible breeders don’t breed Mini Cockapoos this way. Finally, increasing fascination with and demand for very small “teacup” dogs has resulted in some breeders choosing the runts of each generation to parent the next. This is an unhealthy practice which produces weak and vulnerable puppies. It is not common among Mini Cockapoos, but be wary of any advert which describes “very tiny” or “exceptionally small” Mini Cockapoos. This could be an attempt to monetize a runt which is failing to thrive. As we’ve already touched upon, Cockapoo Miniature Poodles are – as their name somewhat suggests – a cross between Cocker Spaniels and Miniature Poodles. Cocker Spaniel and Miniature Poodle crosses are relatively new in the dog world and as such, there’s no interesting historical backstory to them. In fact, no one really knows when breeders first starting to ‘miniaturise’ Cockapoos. But their larger ancestors, regular ol’ Cockapoos, do have something of a known background. This designer breed came into being after a series of deliberate Cockapoo breeding programmes. These first originated in the United States during the 1950’s. Despite being in existence for nearly seventy years, Cockapoos are not recognised by any of the world’s major purebred breed associations. What Are Miniature Cockapoos Like? Miniature Poodle and Cocker Spaniel mixes (sometimes also known as Cockerpoos, Spoodles, Cockerdoodles or Cockapoodles) follow no absolute template. As with any crossbred, they can take after one of their parent breeds to varying degrees. A Mini Cockapoo can bear equal resemblance to both parents, be more Cocker Spaniel, or take after its Poodle parent slightly more. That said, some pretty accurate generalisations can be made. Miniature Cockapoo adults generally grow to a standing height of anywhere between 13 and 15 inches. As for the average weight of a miniature cockapoo full grown? Well, they rarely grow to weigh more than around 30lbs. The average Spoodle will probably weigh in between 20-25lbs. One of the most striking things about this mixed breed is its wonderfully wavy and silky coat. His fur is soft and mostly non-shedding. But despite popular myths, bear in mind that non-shedding does not equate to hypo-allergenic. In fact, there is no such this as a hypoallergenic dog. Mini Cockapoos can come in a variety of colours. Black Miniature Cockapoos are not uncommon, while apricot Miniature Cockapoos are particularly striking. As with the physical traits of the Miniature Cockapoo, behavior and temperament comes from the parental breeds too. Again, there’s no way of being able to predict the exact mixture of traits from the two breeds. And sometimes – a little needy. In terms of coat maintenance, the amount of brushing that a Mini Cockapoo requires will depend upon which of the parent breeds it most takes after. Cocker Spaniels don’t take too much brushing, but to keep a sheen on their coat, regular brush through with a stiff brush is recommended. This advice applies to Mini Cockapoos that take after their Spaniel parents too. If the little crossbreed has a coat more like that of a Poodle’s, then they will need a little more attention. Their wavy hair is liable to mat if not brushed regularly. It pays to be prudent and make sure the parents of any puppy you take on have been health tested. It’s smart because you need to know as much as possible about what might happen to your dog later in life. Fortunately, Cocker Spaniel x Miniature Poodles are rarely beset by problems. But of course there are some health issues to look out for. Both Poodles and Cocker Spaniels have their own medical quirks and it’s advisable to speak to the breeder about the health history of the parent dogs. When dealing with Mini Cockapoo breeders, make sure that they have begun to socialise their puppies. Formative months are vital in a puppy’s life and proper handling in those first few weeks and months can often prove pivotal. These dogs are active and enjoy exercise, so it’s important that they get out and about and are walked daily. Mini cockapoos’ high intelligence means that it can often pay to mix up training to avoid the dog getting bored. There is no way to predict the lifespan of any dog, no matter how much you know of its lineage. That said, it’s possible to use prior knowledge to make an educated guess as to a dog’s life expectancy. With the Mini Cockapoo, again, we look to the parent breeds. Poodles tend to live between 12 and 18 years. 15 or 16 years of age being a pretty accurate average. Cocker Spaniels normally live between 10 and 14 years. Considering their breed parent’s lifespans, the average Mini Cockapoo can expect to live for anywhere between 12 and 16 years years of age. Realistically, Miniature Cockapoo puppies are unlikely to be found in rescue centres. However, even the best pet owners are sometimes forced to relinquish beloved older dogs for reasons beyond their control. So you might one day find a Miniature Cockapoo for adoption through luck or patience. More probably, you will find them with a professional breeder. Visit the them at home and see the puppy in the house. You’re looking for an active, alert and happy little animal that has a bond with its mother and preferably its littermates too. It’s also a good idea to select a puppy that shows a healthy approach to all humans in the house, including – of course – you! Should I Get a Mini Cocker Poodle? As is the general advice given by experts when asked this question of any particular breed or crossbreed, the only answer can really be ‘it depends’. If a Miniature Cockapoo really appeals to you and you’ve fully researched the breed – including its needs and temperament – and you’re confident that you can provide one a happy and stable home, then go for it! If you’ve got, had or looking to take a Mini Cockapoo into your life, then let us know your thoughts and experiences in the comments below. We’d love to hear them. D. Caroline Coile, 2006, The Cocker Spaniel Handbook, Barron’s Educational Series. Lowell Ackermann, 2011, The Genetic Connection; a Guide to Health Problems in Purebred Dogs.